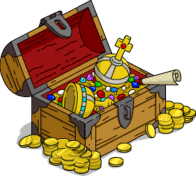 Should I Spend Donuts on the Returning Chest of Sacred Artifacts, Treasure Chest or Pirate Bundle? My Opinion On It Now: Meh. Not worth 55 donuts…pass. My Opinion On It Now: Meh. Totally not worth 85 donuts…pass. What Does It Do? : Decorations, so not a whole lot. 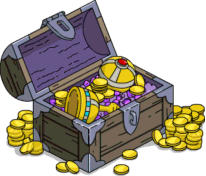 This entry was posted in Decorations, Donuts, Should I Buy, Tapped Out, Updates and tagged should I buy the chest of sacred artifacts, should I buy the pirate bundle, Should I Buy the Treasure Chest, Tapped Out Tips and Tricks, The Simpsons Tapped Out, Time Travel Toaster Update, Toaster Time Travel Event, TSTO Addicts, TSTO Time Travel Event, TSTO Tips and Tricks, TTT Update. Bookmark the permalink. I am glad EA reissues characters, buildings,… In my freemium time I missed out a lot of characters due to lack of donut. Now as a farmium I can purchase all the thing I want. How on earth does anyone ever save $20,000,000 for the dam? Wouldn’t it take months and months? Seriously. I play incessantly but this seems like it will take forever. Long time players have 20 million 💵💰in their back pocket and are able to create that amount within a few days. I didn’t buy the treasure chests originally, but I picked up several this time. Overpricedo but I like them. No percentage increase, but it’s additional income and xp. 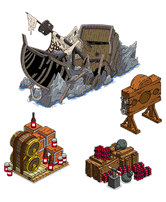 Will there be a new themed mystery box coming tomorrow? Unrelated question to this event!! But I had a small update with Cecil T. and he was talking about the Springfield Dam. I’ve been pumping cash into it but nothings happened yet…did you guys do a section on it? I’d love more info if possible. Thanks! Keith – click on the calendar in the upper-right corner. then, click on the green calendar icon on the left. that is the task list for the “Roads to Riches” storyline. You might not have put enough towards the dam yet for it to be unlocked ($20M). Keep on pumping game cash until you reach 20 million, then you get rewarded the Springfield Dam. For me, the shipwreck alone would be worth the 🍩 price. T tree is on sale for 5 doughnuts…. don’t remember seeing a recent post on it. is it as good a deal as it seems? Any time you can increase your bonus % for 5 doughnuts I say go for it. The weird thing is if you look in the regular store items it sells for the regular amount. If you buy, say, 6, that’d put your bonus percent at 3% for 30 donuts. Amazing deal for the T tree. I bought one and am considering more. You have to have 15 donuts to get one, but get 10 donuts back. So if you buy 10 for total 150 donuts, you get 100 donuts back and get 5% bonus. I don’t have 150 donuts, but am buying one every time I scrounge together 15 donuts… Might let loose of my game cash to buy rat trap delivery trucks (in keeping with the theme) to get more than I can harvest. I hope the deal holds until the end of the event, they haven’t put time limits on them. Yes, it is that good of a deal. Besides a great deal for bonus-percentage, the T-tree has excellent design potential since you can put them end-to-end and create a wall-like effect. It looks great lining a path in Springfield Heights. Two rows line my Springfield Beach seperating the regular SF from SP. I usually average better return on that by buying Mystery Boxes. Hint – every time I score a Channel 6 news van the following box *always* seems to give 10 or 30 bonuts. Those trees reminds me of the Greek sirtaki.